It was in the small town of Bellac, about half way between the ancient cities of Poitiers and Limoges, that we found our perfect home. As soon as we opened the door of the nine-bedroom house we fell in love with the wood paneling, parquet floor, and carved staircase serving three floors. It cost us €215,000 ($248,528) and that included two acres of park-like gardens leading down to fields and a spectacular view across the Vincou river valley to the Blond Mountains in the distance. The place was in good condition but had not been loved for a long time. It was full of French touches—wallpapering (mostly in bright flowers or paisley) all over walls, ceilings, cupboards, doors, etc. Living there meant we had a rural setting in a town which had all the services we could want, like huge supermarkets, a hardware store, hospital, doctors, dentists and of course a liberal sprinkling of cafés and restaurants. It wasn’t the first place we viewed and we can’t emphasize enough how important it is to see a house in person before making up your mind. We started our property hunt in the Charente department. Each day we set out to look at houses. There are lots of English speaking immobiliers (real estate agents) and we looked at some terrific properties but nothing really charmed us enough to take further. We had seen a house online that interested us in Confolens, a small town on the banks of the Vienne River. We called it “The Tower House” because it was very old and had a round pigeonniere (dovecot) at one end. Lorraine had dreams of restoring the tower as a honeymoon suite to rent out. The house was in a small hamlet of three other houses and was for sale either on its own or as a job lot with all the others—which were generating rental income. We visited with a lovely, chatty agent. The house was on the market at €285,000 ($329,569), a little above our budget but exactly what we wanted. We asked along a local, English-speaking builder and architect. He spotted things we hadn’t noticed. We totted up the rough costs of fixing it and when it got to about €100,000 ($115,637) we knew it wasn’t for us. 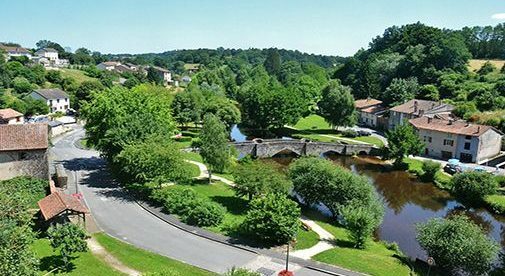 Our travels took us south through the Dordogne, which is hugely popular with English expats, down as far as Pau, which is in the French Basque country near the Pyrenees and the Spanish border. We then started to move back up the country before finding our dream home in Bellac. When we bought our house, it needed some work including a new bathroom and kitchen, but we could move in straight away. We tidied up the backyard and discovered fruit trees. There were two different types of apples, a cherry tree, quince, damson and, along the garage wall, several pear trees which we didn’t know were there until they started fruiting. We cleared the undergrowth and savagely pruned the pear trees in the hopes of a good crop. We planted some more fruit trees—several more apple trees including my favorite, Fuji, two different types of plums, raspberries, and white and black currants. We also planted two different types of grape to cover up an old metal frame. The hedges are full of brambles which provide kilos of sweet blackberries. They’re a pain to prune but delicious in pies and there’s nothing like a blackberry and apple crumble made using your own fruit. I dug a vegetable garden and we had our own tomatoes, potatoes, and squash. We also established a productive herb garden with parsley, sage, rosemary, thyme, and mint. As they grew they made a beautiful entry to the back door. Because this is an old house and comes with a massive garden, there are some unbelievably beautiful and very old rose bushes, dazzling displays of daffodils, and every type of flower you can think of. To get an idea of properties available near where we live, the cheapest I saw was a semi-detached house with a brand new roof—but in need of complete renovation—within 10 minutes of Bellac for just €8,000 ($11,200). This was only being advertised on a Facebook group but as you can probably figure out, at that price there was a great deal of interest. Buying property in France sounds complicated but if you relax and follow the steps it doesn’t have to be. Use a competent agent and a notaire you can understand and you will soon be living the dream in your own French home. The notaire is the most crucial player in the process. He will make a forensic examination to check things like making sure the seller actually owns the property, the mortgage status, agreed easements, planning regulations, and so on. At the end of all the searches, the notaire asks for the full amount for the property prior to the final settlement. This is held in a government-monitored account. If you have a mortgage, the bank pays the money to the notaire. In most cases the seller and buyer use the same notaire; they work along lines strictly controlled by the government so it is not seen as a conflict of interest. The notaire has wide-ranging powers and fees regulated by government depending on the price of your property—for anything over €30,000 ($41,200) it is just under 1%. The total fee you will be quoted includes everything, such as stamp duty, registration taxes, and other disbursements (except the real estate agency commission). This means you won’t be stuck with surprise fees. We were lucky to find an English-speaking notaire who was happy to translate everything for us.